Do you need a wall tie survey? Do you know what problems result from deteriorated wall ties? Sometimes called ‘brick-ties’ wall ties are used to connect the two skins (brick-brick, brick-block, concrete-brick) of a wall across the cavity. They are typically made of metal (steel, galvanised steel or stainless steel) or occasionally a composite or plastic material. Simply, they tie the two skins of a cavity wall together, allowing them to work together providing greater strength and stability. If existing brick ties fail, or if there are insuficient numbers, the wall is less strong than it otherwise would be and could fail. Failure could take a number of forms including bulging, cracking, loss of the outer skin or total collapse. Buildings constructed from the 1920s onwards are likely to have a cavity in the walls. Joining these cavities should be brick ties. Building regulations and other standards (EC6, EN845, PD6697 and BS5268) have dictated the specification of, length and density of the brick ties (number/square metre) for use in a variety of buildings. Many older buildings suffer from corrosion of brick ties leading to deterioration of a the building. Newer buildings showing signs of wall failure exhibit the effects of too few ties being used during construction. If you think you need a wall tie survey please contact us. Initial surveys are non-intrusive, more extensive surveyss will require holes to be drilled for borescope investigation. 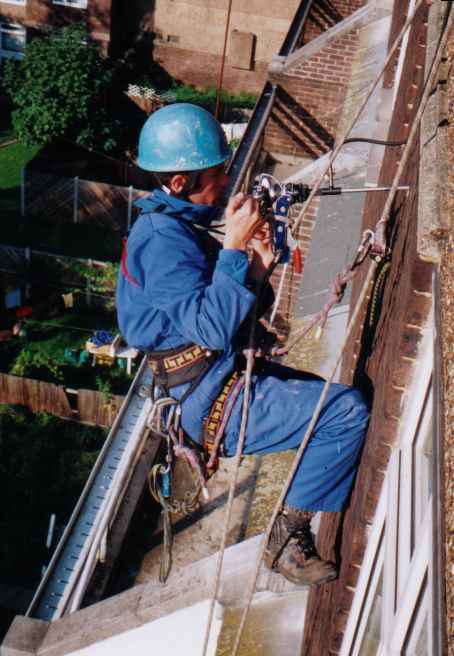 We are also able to offer surveys on high rise buildings using rope access techniques. This reduces distrurbance to building residents. We also offer a wall tie replacement service. We utilise a range of products that ensure that we can satisfy the needs of your building. This entry was posted in Building, Building Maintenance and tagged brick ties, cavity wall, wall tie.